Camp Season's Coming Label Your Lookalikes! ChiIL Mama's partnering up with Label Daddy once again, on a sponsored post, so our readers can get a jump on the summer migration of stuff to the lost and found. Order yours today. I have one spacey teen, and in her Freshman year she's lost an expensive calculator, at least 4 hoodies, NIKE slides, a pair of pants, a pair of shorts, a double digit # of lunch boxes and bags, her poms team t-shirt, 5 bus passes, and more. If this sounds familiar, stock up on some washable labels and increase your chances of getting some of your lost items found. We've been using them since the kids were infants and we still do. You're never too old lose your stuff. 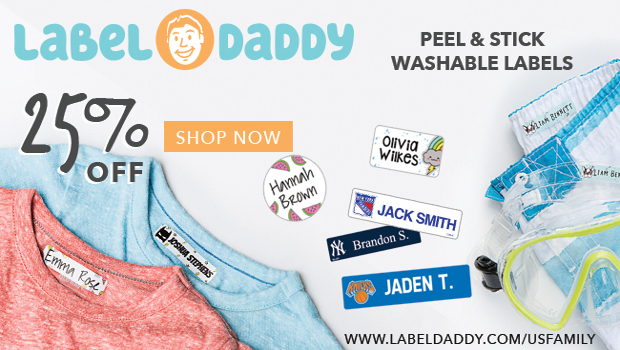 Label Daddy is the number one solution for labeling your belongings! Their exclusive laminated coating gives labels an extra layer of protection and is a must for camp! Remember to label all clothing, sports equipment, electronics, and other personal belongings your kids bring to school, camp, sports leagues, day care, vacation, and other places. Label Daddy labels keep them from getting lost or mixed up with others. These labels are great for adults too! -- Put them on your sunglass/eyeglass case, phone, camera, sports equipment, tablet, e-reader, hats, clothing, and more. These labels are super durable peel-and-stick washable labels -- they're washer/dryer safe, microwave safe, dishwasher safe and UV resistant! Label Daddy labels are also fun and attractive. You design your own labels! Pick from tons of colors, sizes and logos, including MLB, NBA, and NHL team logos, other sport and fun logos, and more. These labels are made in the USA and shipped directly to you worldwide. Save 25% on any label order from Label Daddy - this is the best discount available anywhere. Click here. The discount will be automatically applied at checkout. Disclosure: I have been compensated for sharing this deal with my readers. As always, all opinions are my own.